Dealing with a central character living destitute in Dublin, suffering from any number of severe psychological complaints, Kinevane’s script can’t be accused of dodging any issues. 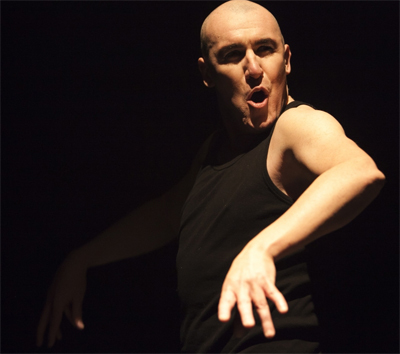 Of course, Kinevane’s other Fishamble success, Forgotten, deals with a similarly disenfranchised member of society, and it would seem that – as both writer and performer – Kinevane has a wonderful skill for portraying individuals trapped at the fringe. Although never too direct or too heavy-handed, the play does have a very clear message. There’s the story about Tino’s brother, Pierce (“named for Padraig”) victim of small-minded gossip and narrow prejudice, but there also Tino’s own struggles with the system inside and outside it. Tino rails against the HSE’s admittedly shallow “look after yourself” mental health campaign while singing the praises of the Simon Community and St. Vincent de Paul (“this city’d be a famine ship without them,” he assures us). It is thoughtful, articulate and well considered. Kinevane does well to favour engagement and discussion rather than stern moralising. That said, there is something quite surreal about Tino. Tino is frank and honest with the audience – he accepts his own role in the circumstances that led to his predicament. He drank too much, he pushed away all the loved ones in his life, he never sought assistance that might have helped. And his anger, where one can detect traces of it, is leveled against the nebulous system – the doctors who dealt with him, the authority that placed him in a mental institution. However, he’s very careful not to hold any anger against people or society in general. Tino seems almost zen about his situation. He is living in inhumane and dire conditions, subjected to the very worst of the world, and he never seems to harbour any anger or resentment towards the people who pass him in the street. He’s quick to thank those who give, no matter what (even if he’ll make somewhat fair criticisms about the value of a Danone bottle) – and doesn’t condemn those who ignore him or pretend not to see him. We’re told one in six hundred will actually acknowledge him, but there’s not a trace of indignation or upset or righteous anger directed towards the other five hundred and ninety nine. Even when he talks about the rugby lads who abused him after emerging from Lily’s Bordello, there’s no sense of resentment in his voice. I suspect that might be because it would make the audience uncomfortable. Tino engages the audience repeatedly during the performance, and he’s always good-natured. Even when he threatens to steal and handbag, he seems to be joking. It never seems to occur to Tino that he’s addressing a room full of people who, based on his own statistics cited earlier on, wouldn’t look twice at him out on the street. If it does occur to him, he never seems to allude to it. Of course, directly challenging an audience is a risky proposition, and perhaps it’s for the best that Kinevane skirts around the issue. 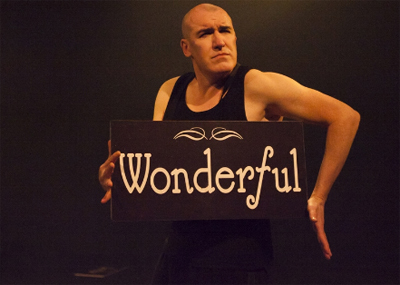 Besides, Tino’s a natural-born storyteller brought to life with an assured confidence and wit by Pat Kinevane. He recounts his life in a charming and engaging manner – never losing the audience despite branching off on countless tangents and anecdotes. It’s a great performance, and Kinevane completely owns the stage for the eighty-minute duration of the show. There’s a wonderful choreography to Tino’s movements – at certain points he is even dancing. It’s energetic and skilfully put together, never overwhelming or distracting. The sound and lighting design is impressive, ensuring that the shoe crackles with a wonderful energy. Again, this is a one-man show, and Kinevane anchors the story he’s telling, but the sound mixing and the lighting set-up both create a powerful atmosphere. 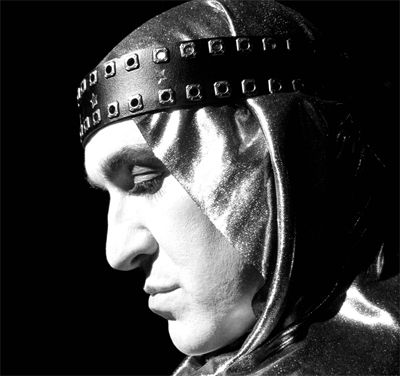 They allow Kinevane to almost construct his own set on the mostly-empty stage, whether it’s echoes reverberating around the theatre, or a massive spotlight overhead allowing his shadow to move in the most exotic of displays. Director Jim Culleton has put a wonderful show together – it’s magnificent. The whole production is, of course, centre around Kinevane – and that’s a smart decision. However, Culleton makes sure that Kinevane has all the support he needs in order to provide a powerful and moving piece of theatre. Fishamble have a long history of producing memorable plays exploring life from unique angles, executed with impressive technical skill, and Silent continues the trend admirably. While the show’s time on the Peacock stage is entirely sold out, I would recommend checking out one of the tour dates if at all possible. It’s a well-constructed and thoughtful piece of theatre. All photos from abbeytheatre.ie. The credit I can find is Ger Blanch.